NEW YORK—A photo taken from the Staten Island Ferry and posted on Twitter shows a poster board leaned against the ferry railing with a message to the Islamic State of Iraq and Syria, a militant terrorist group. An al Qaeda magazine for terrorists features a photo of the U.S. Open as a suggestion for a bombing target. The NYPD believes that these are among a multitude of hints that the escalating turmoil in the Middle East has a direct impact on New York City. Police Commissioner William Bratton was concerned enough to convene the NYPD Shield conference on Wednesday at an unusual time in the middle of the summer. 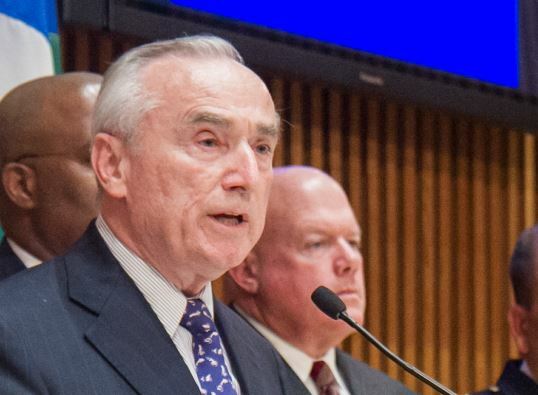 “Two thousand years ago the expression was ‘all roads lead to Rome.’ Well in 2014, as it relates to this subject matter—terrorism—unfortunately, all roads lead to New York City,” Bratton said before the Shield crowd at the police headquarters on Wednesday. Shield is an umbrella program bringing together security managers from private companies with police counterterrorism staff. As part of the partnership, NYPD provides intelligence and training to its private partners. In exchange, the private companies share information like footage from surveillance cameras. The attendees were briefed on the latest developments in the escalating conflicts in Iraq, Syria, Israel, and Palestine. Part of the presentation focused on how refined terrorist propaganda and recruitment methods have become, with slides depicting glossy magazines for terrorists and polished recruitment videos. The Islamic State of Iraq and Syria, in particular, has been employing social media to spread its message. Police deemed the photo taken from the Staten Island ferry to have been digitally manipulated, but Bratton nevertheless instructed those present to be vigilant. The New York Police Department is temporarily assigning at least 313 more police officers to street patrol over the summer.